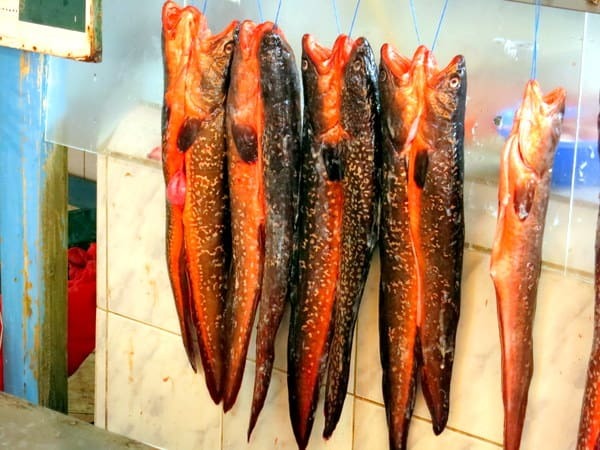 The Coquimbo Fish Market offers visitors a virtual harvest from the sea. When our Seabourn cruise ship docked in Coquimbo, Chile, the smell of fresh fish wafted in the air. Only a dozen or so cruise ships arrive here each year between November and March. Chile has more than 2600 miles of coastline on its western border. Similar to many other ports up and down the coast, this one is gritty and industrial. The natural port (which was seized by the Spanish in the 1500s) is used predominantly for shipping fruit (especially table grapes) as well as copper from the mines but its temperate waters are perfect for catching fresh fish and shellfish, which are often exported as fish flour and tinned fish. The Coquimbo Fish Market may be hard to find if you are staying in the city but it is impossible to miss if you are coming off a ship. Loosely translated, the name Coquimbo derives from the “place of calm waters” but on a Sunday afternoon, the market is anything but calm. It’s bustling with families who come here for lunch at one of many stands that sell ceviche, tasty fish empanadas and other fish dishes that are fried, stewed and baked right at the dock. Walking past the stalls, we spotted mussels, eels, sea urchins, Patagonian toothfish (which is renamed Chilean Sea Bass in the U.S. and Canada), scallops, king crabs, and oversized clams and razor clams. Customers bargain with their favorite fishmongers, who are cleaning and fileting the fish that hang on wooden rods like fresh laundry. We stopped to taste some empanadas ($2-3 each) that were filled with your choice of seafood and fried while we waited. We also couldn’t resist the walkaway plastic cups of moist ceviche, usually made here with sea bass, “cooked” in a combination of grapefruit and lime juice and then flavored with cilantro and minced chili peppers. Well worth a visit! Come hungry. Very interesting and, as always, I love the photos! !